“The Master” has already been hailed as a masterpiece by many. I don’t know if that word is exactly right. It is too confounding and too hard to solve in one viewing to already be hailed as a work so perfect that it dwarfs all other films that come near it. The whole thing is like a dream you’re trying to recall: it’s messy and sometimes hard to fully piece together, but it is ultimately engrained in memory. 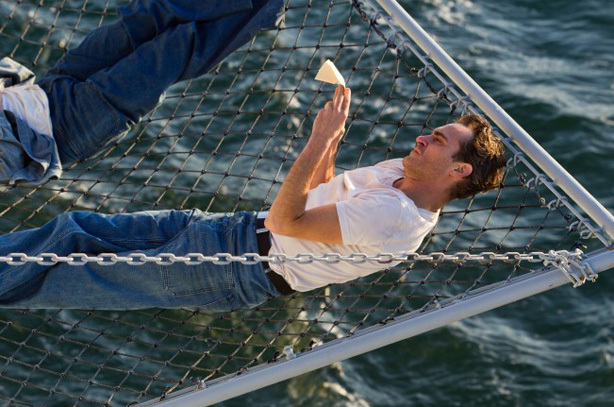 “The Master” opens up at the end of World War II, as Freddie Quell (Joaquin Phoenix) cruises listlessly on a battleship returning home from the Pacific. Like the beginning of Paul Thomas Anderson’s previous feature “There Will Be Blood” (which deserves to be hailed as a masterpiece), “The Master” starts off quietly. We are asked to observe humans as if we are observing animals at a zoo. This is important, as the cult this film revolves around believes that humans and animals aren’t too different. Little is told about his war experience, and very little needs to be known. He has probably killed enough people to haunt him forever. Also, he hasn’t been with a woman in a long time. After serving under orders for so many years, Freddie and the other soldiers are told that for the first time, they can now do whatever they want. Listless Freddie goes from one job to another, always getting kicked out for drinking too much and starting fights. Freddie would have found himself a very good fit in a Hemingway novel. All of the aggressive and confused qualities are there. He is like someone from the Lost Generation that got transported to post World War II America. The film shifts from third person to viewing the world almost entirely through Freddie’s eyes. Once he decides to wander onto a party boat in San Francisco, the eventual story begins to form. Freddie wakes up in a drunken haze the next morning and meets the man commanding the ship: Lancaster Dodd (Philip Seymour Hoffman). Dodd bares a strong physical resemblance to L. Ron Hubbard, and they both have atypical first names (Hubbard’s is Lafayette). Yet, Dodd’s newly formed ideology, The Cause, bares a name that is much more vague. Much has been said about how this film is not so subtlety based on Scientology. A fascinating question this film asks about Dodd (and, in effect, Hubbard) is this: did a man who was actually this smart somehow buy into his own lies? “The Master” is largely about a world that is built on delusion and filled with people who take comfort buying into lies. Freddie follows The Cause as it builds into a phenomenon in 1950. He is taken in by the Dodd family, and has a mixed relationship with them. He constantly has his eye on Lancaster’s daughter Elizabeth (Ambyr Childers). Meanwhile, Lancaster’s wife Peggy (Amy Adams) sees danger in Freddie’s erratic behavior, and Val (Jesse Plemons) tells Freddie that his father is “making all of this up as he goes along.” Freddie is never there against his will, yet he chooses to stay. Lancaster Dodd, played to perfection with mystery and almost too kind of a demeanor by Hoffman, is a commanding force. Like every leader of a successful movement, he can sway so many because he uses just the right word every time he speaks. While Lancaster is not far off from Hubbard, at times he made me think of Charles Foster Kane. Like Kane, he speaks so smoothly and confidently when swaying others, yet can break down when his wisdom is questioned. While Lancaster Dodd is the master referred to in the title, this is actually Freddie’s story. Phoenix makes the most of this and delivers what will likely be a career-defining performance for him. He says so much in so few words. Behind his eyes, there is emotional pain that we can’t even imagine. Sometimes, he appears to be talking out of the side of his mouth, as if there is something more that he will never tell us. He is so unpredictable that at every turn, I didn’t know if I should anticipate a mental breakdown or not. Surprisingly, the most powerful thing about Phoenix’s performance is the occasional smile he gives, and his sense of humor that arises at the most perfectly inappropriate moments. At this point, Paul Thomas Anderson is assured enough of his voice as a filmmaker that he doesn’t mind breaking the rules. There are long stretches of time with just dialogue and no action. Yet, he can make scenes like that simmer with tension. When Dodd first questions Freddie, Freddie is told that if he blinks, they will have to start over again. Just from that line, the stakes of this scene suddenly become so much higher. The closeups make it seem like two men are staring directly into each other’s souls. “The Master” is brought to life with Mihai Malaimare Jr.’s stunning cinematography. The landscapes and darkly lit rooms often made me feel like I was watching an Edward Hopper painting come to life. While the people are corrupted, the land feels more pure than it did in Anderson’s other works. Meanwhile, Jonny Greenwood’s score injects jolts of unexpected emotion that guides many scenes so well. Meanwhile, a few previously recorded songs from the era invoke a sense of melancholy. Yet, the subtle approach of “The Master” sometimes serves as its downfall. At times, it says too little and doesn’t give enough to guide the audience through. Some important scenes lose their power right after they end, because nothing builds off of it. Lancaster is not given enough obstacles to overcome and Freddie rarely seems like he is in much danger. I feel like I have to compare “The Master” to “There Will Be Blood,” as “There Will Be Blood” was Anderson’s last film and the one in which his vision was most fully formed. “The Master” sets up many ideas, but it doesn’t set up as many conflicts that we are dying to see play out in the same way that “There Will Be Blood” did. “The Master” lacks that seamless flow. I am sure that many of the greatest detractors of “The Master” will claim that it is a bunch of pretty looking scenes strung together with no purpose. I believe there is more to “The Master” than that, but the strings holding it together certainly felt loose at times. Even with my objections, I cannot place myself into the camp of detractors. The wildly ambitious nature of “The Master” is something to marvel at. One viewing simply won’t do it justice. The ending stirs more questions than answers, but they are the kind of questions that give way to deep conversation afterwards. “The Master” is not simply about The Cause. It’s about what Freddie’s actions say about the rest of mankind. He is someone who wants to be controlled while maintaining independence and he finds that you may only be able to have both. Saying much more may not do anyone well, as there is still so much more to explore below the surface. While it does not end with the bang I expected it to, “The Master” concludes in a manner that is surprisingly thoughtful. Paul Thomas Anderson has broken from his own master (cinematic conventions) and managed to make something that is so abstract yet at times, so clear. Still, there is so much more I wish I could have seen. This entry was posted in Amy Adams, Jesse Plemons, Joaquin Phoenix, L. Ron Hubbard, Movie Review, Paul Thomas Anderson, Philip Seymour Hoffman, Scientology, The Master on September 24, 2012 by ian0592.